How to use Punch Limiting with scheduling. Use Punch Limiting and scheduling together to ensure your employees are punching time only when they're supposed to. 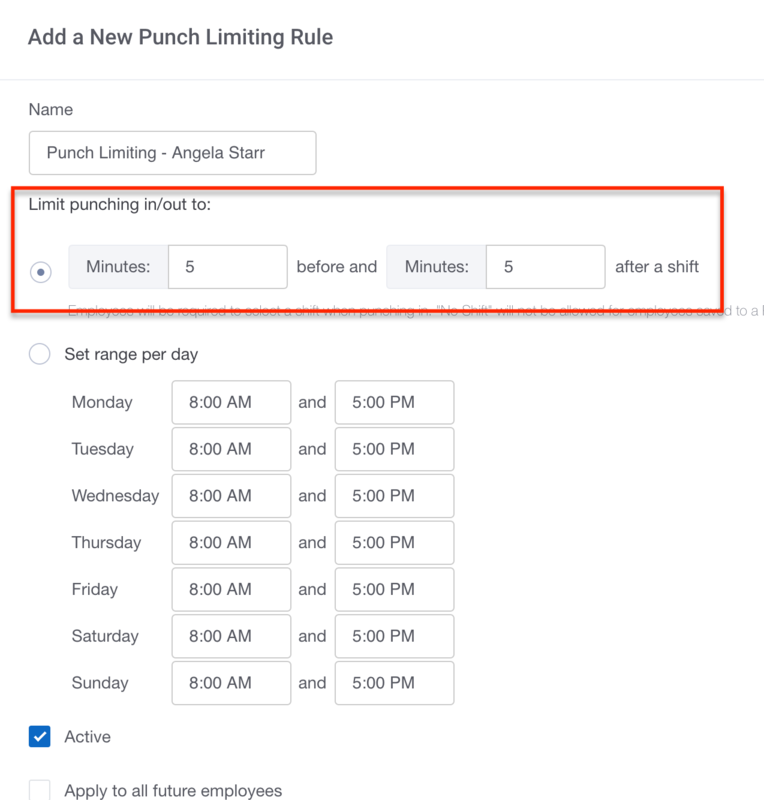 Punch Limiting can be used with the scheduling feature to allow you to determine how soon before or after a shift an employee can punch time. To set this feature up, you'll visit Settings --> Punch Limiting and select +Add a New Punch Limiting Rule. Enter the name of the rule and decide how soon before and after a shift an employee is allowed to punch time. Please note: When using this option employees will not be able to select "No Shift" when punching in. Once you've entered in the time make sure to check the Active box, assign the appropriate employees, and Save! If an employee tries to punch in/out outside of the time frame, they will not be able to. If you have employees that frequently stay late and need to make sure they are able to adjust their time outside of the punch limit, you will need to enable edits by going to Settings --> Account Settings. Employees will then be able to adjust their punch times. If you'd like to be notified of any punch changes, enable both "Requires Approval for Time Card Changes" and "Requires Approval for future PTO Requests" from within the employees profile. Any punches changes will then go to their Manager or Administrator for approval.